Detailed review of Tree Hut Shea Sugar Scrub. See how it stacks up against other exfoliators! I really liked this body scrub from the minute I opened it. First of all, it is a really pretty orange/pink sugar scrub that smells like mangos. Even for the cheap price, this could pass as a higher end product. This is packaged like most sugar scrubs in a larger jar with a screw-on lid. The sugar granules in this scrub are fine like table salt, so it really does a great job at exfoliating. I thought the ratio of sugar and oils was great – it had enough sugar to help remove that dead skin while having enough oils to moisturize at the same time. The price is crazy cheap – this is an 18 oz jar for $6.07, which is plenty of product. I was especially surprised at the price with all the different oils in it like the sweet almond oil and the avocado oil. Overall, I thought this was a great body scrub that is fun and refreshing to use. This is a sugar scrub with fine grains like the size of table salt. Unlike most sugar scrubs that I have used, this almost has a gel-like consistency, so the oils and sugar don’t really separate, which is great! 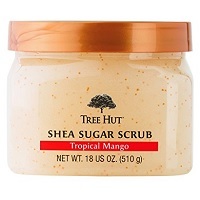 Tree Hut Sugar Scrub smells just like the description – tropical mangoes! It smells so yummy and refreshing! Like most sugar scrubs, this comes in a large jar without an easy way to dispense it. Thankfully, using it in the shower makes it less of an issue, but I had to scoop it out with my hand each time, which is pretty messy and gets water in the jar during application. I really like that this is somewhat of a gel, so I didn’t have to mix it around at all like other scrubs I have used in the past. The grains of sugar are nice and fine, so exfoliating was really easy. I didn’t have to apply too much pressure to really get my skin feeling smooth. I was able to rinse it all off with warm water just fine. It didn’t leave any oily film on my skin, which was nice. I noticed I needed a lot each time I used it, but I thought it was ok for the cheap price of $6.07 for 18 oz of product. I didn’t have any drying or redness even after using it multiple times in a week. Right after using it, my skin felt really soft and well exfoliated. The oils helped moisturize my skin, but I noticed as time went on I definitely needed lotion on my legs and arms after using it. I was able to exfoliate evenly across my legs and really saw the difference in my skin right after applying it. Over time, I definitely saw a difference in the tone of my skin and the overall brightness after using this scrub. I was impressed at how well this worked over time, especially for the really cheap price. Since this does such a great job with exfoliating, I was able to use it less often than some other products I have used in order to avoid my skin from drying out. Overall I thought it did a great job. It is definitely worth the price. This sugar scrub contains Shea Butter, which is packed with different vitamins such as Vitamins A and E. Shea Butter is used in tons of moisturizers and exfoliators. It is popular because of its ability to hydrate skin and lock in moisture. Evening Primrose Oil is used to help prevent inflammation and keep skin looking firm and healthy over time. Avocado Oil has been said to help new skin cells develop to keep skin looking younger. It also protects cells from potential damage caused by pollution and free radicals. Tree Hut Sugar Scrub is extremely cheap. I purchased this one through Amazon for $6.07 for 18 oz of product! I thought especially for how effective it is, this price is amazing. I would really recommend this for people who are looking for a refreshing addition to their skincare routine who are also on a tight budget. To buy Tree Hut Shea Sugar Scrub, click here.